St John hotels, resorts, and other accommodations offer you a wide array of great choices. You'll find everything from luxurious five-star resorts to simple, homey inns; from modest condominiums to opulent multi-million dollar villas. You can even choose among several campgrounds! Note: all rates quoted are for the winter high-season. Low-season rates are generally 60% - 75% of high-season. Also, keep in mind that each of the St John hotels has its own definition of high- and low-season. Some places divide the year into several different seasons while others don't change prices at all throughout the year. You'll find an array of nice rental condos on St John. These range from quite modest to plush and luxurious. For a guide to condo rentals on St John, click here. There are really only two full-scale luxury resorts among St John hotels. The Westin is a modern, self-contained luxury hotel set among 34 acres of beautifully manicured gardens. It has all the hallmarks of a five-star resort. These include over 170 posh guestrooms and suites plus 92 villas, a pool that's a quarter-acre in size, and four restaurants complete with 24-hour room service. The Westin offers tennis, watersports, an exercise studio and spa, gift shop, and a quarter-mile long, palm-shaded, white sand beach. 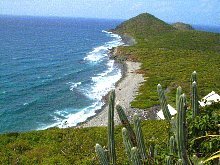 It's located just a few minutes southwest of Cruz Bay at Great Cruz Bay on St John's southern shore. High-season rates start at around $600 a night. Caneel Bay is the original, old-line luxury resort among St John hotels. It was founded in the 1950's by mega-millionaire Laurence Rockefeller after he donated more than half the island of St John to the Park Service. For a complete discussion about Caneel Bay Resort, click here. There are several good choices in smaller St John hotels, inns, bed & breakfasts, and guesthouses. These places are far more modest than the big resorts, but they offer good accommodations at reasonable prices. St John Inn is in Cruz Bay, just a few minutes walk up from the ferry dock and overlooking Enighed Pond. Thirteen pleasant, modest guestrooms, some with private baths and kitchenettes, all equipped with refrigerators, coffee makers, microwaves, A/C, fans, TV's, and phones. There's a small shared sun deck with a small dipping pool. Rates range from $160 to $315. 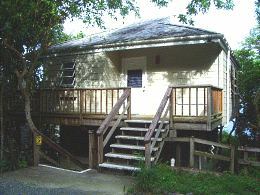 Samuels Cottages offer three modest one-bedroom cottages a short way up Centerline Road from Cruz Bay. Simple, clean, homey accommodations that include kitchens, private baths, and decks with views overlooking Cruz Bay. Probably the best value on St John! Rates start at an amazing $100 per day. Estate Lindholm is a 20 room guesthouse near Cruz Bay which offers nicely appointed rooms. Located in a beautiful, lush garden setting surrounded by restored Danish plantation ruins. Rooms offer private baths, coffeemakers and microwave ovens, and garden or harbor views. Rates start at $320 per night. 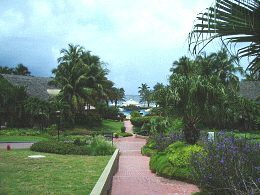 Garden by the Sea is a charming Bed and Breakfast just outside of Cruz Bay near Turner Bay. It offers three guestrooms with A/C and spacious bathrooms, but no T/V or phones. Overlooking the sea, just a one-minute walk from the beaches of Turner and Frank Bays. Breakfast is served on the open veranda. Rates run from $250 to $275 nightly. The Inn at Tamarind Court offers a variety of choices ranging from economy rooms with shared bathrooms to guestrooms and suites with private baths. A homey, courtyard setting in Cruz Bay, just five minutes' walk uphill from the ferry dock. There's a restaurant that serves breakfast daily and dinner every night but Saturday. Rates range from $75 to $240 per night. Estate Zootenvaal is a group of four spacious one- and two-bedroom cottages situated on the eastern end of St John at Hurricane Hole (near the town of Coral Bay), within the boundaries of the National Park. This place is for folks who want serenity and privacy. Cottages are equipped with kitchens and private baths, and ceiling fans, but no telephones or TV's. On a beautiful beach with excellent snorkeling just off shore. Rates range from $275 to $550 a night. They also offer weekly rates. Harmony Studios is a series of hillside studio-cottages associated with the famous environmentally-friendly Maho Bay Camps (see below). The cottages are constructed of recycled materials, and are powered by wind and solar power. They're situated uphill from and overlooking the Maho Bay Camp, and surrounded by thick forest. The Studios are equipped with private bathrooms and small but nice kitchenettes with small fridges, microwaves, and twin gas burners. The studios have ceiling and room fans, but no A/C or TV. There are communal phones shared by several cottages. Harmony is located up a rather rough, steep road, about a 20 minute drive from Cruz Bay, so a rental 4x4 definitely a good idea. Most of the studios are reached by long staircases, so if you can't climb many stairs, make that clear when you're making your reservations. Rates run from $215 to $240 a night. 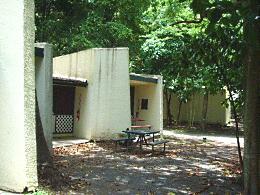 Cinnamon Bay Campground is the original St John campground, located in the National Park and run by the Park Service. It's situated on flat land (rare on St John)at the shore of Cinnamon Bay, one of the best beaches in the Caribbean. You have three options at Cinnamon Bay: a bare campsite where you can pitch your own tent; large, campground-owned tents; and concrete-sided cottages with screened, open fronts and backs with privacy curtains. All three kinds of sites have small charcoal grills and the cottages also have small gas stoves. There are communal bath-houses, a small store and restaurant, and a small watersports center. The campground has a web of excellent trails through the forest and along the shore. Bare sites are $27 a night, tents are $80, and cottages are $110 to $140. Maho Bay Camps has gained fame as the most eco-friendly accommodations in the Caribbean. Founded in 1974, Maho Bay is surrounded by the National Park. It's construction creates minimum impact on the land, with raised boardwalks and wood-framed platform tents mounted on pilings to reduce destruction to the surrounding forest. The tents are divided into sections, creating a cottage-like feel, and come equipped with coolers, small gas camp-stoves, and open sun-decks. Maho has a small store and cafeteria-style restaurant and offers nightly classes in things like glass-blowing and pottery. The campground is situated on a steep hillside above a very nice beach, so be aware that there are lots of stairs here. The camp offers inexpensive shuttle service to and from Cruz Bay, but I recommend renting a 4x4. Rates are $130 to $135 a night. For a more complete description of Maho Bay Camps, click here. Concordia Eco-Tents is Maho Bay's sister property on St John's eastern end, with spectacular views overlooking Salt Pond Bay. The tents are similar in design to those at Maho Bay, with a few added creature comforts like private bathrooms with hot-water showers. There's a pavilion with a small shop and restaurant on site. A vehicle is a must; Concordia is about a 40 minute drive from Cruz Bay and about 10 minutes from Coral Bay. Rates run from $155 to $185 a night. One alternative to saying one of the St John hotels is to rent a house or villa. You'll find many, many St John villas and private homes available for rent. These range from modest one- and two-bedroom cottages up to huge, incredibly opulent mansions. Dozens of these properties are available through a number of local rental agencies which specialize in these kinds of places. A number of others are leased out directly by their owners. The range of prices is tremendous, starting for around $1,000 per week and going up, up and up from there. At least a few villas rent for $10,000 to $25,000 a week and more... and they're often full throughout the high-season!